Why does sharing YouTube videos from another web page / blog / etc. not work? I have a new license key for ShareOnVibe. Can I overwrite the old one? Can I change the language of ShareOnVibe? Are there any differences in the functionality of ShareOnVibe when using it on Linux or MacOS? What do I have to take into account when installing a new version? There is no “Add current folder” in the context menu. I added a folder and did choose to make a test entry. Creating a test entry doesn’t work, I get an error message. My shared entries seem to be created from another author in Vibe. My shared entries do not appear in the Vibe folder I expected them to be. I tried to add Wiki topics as targets for ShareOnVibe but couldn’t access them with the “Search”-function in the folder configuration. When I try to add folders to my ShareOnVibe configuration the “Search”-function can not find sub-folders of folders. I want to share web content to a Wiki folder / Wiki topic. Sharing doesn’t work, an error message appears. Upgrades to Firefox versions 22.x or higher result in problems or unexpected behavior of ShareOnVibe. ShareOnVibe does create duplicate entries in Vibe from time to time. A selection / selected text can not be shared and I get an error message saying the selected text “produced something that the server rejected”. ShareOnVibe can only share videos directly from YouTube. It is not possible to share an embedded video from another page currently. To share the video, click on the YouTube link (usually below the video) and open the video on YouTube (alternatively double-click the video’s title to open it on YouTube). Then, right click next to the video and choose “Quick ShareVideo”. Open Firefox and type “about:config” in the address bar. Search for “ShareOnVibe”. Note: Be careful to not delete any values unintentionally! Find the lines “extensions.shareOnVibe.regName” and “extensions.shareOnVibe.regKey” and clear the values in those lines. Open the ShareOnVibe configuration, click the key symbol and add the new values for registration name and registration key from your new licence. ShareOnVibe is available in English and German. The language of the Add-on is the same as the language of your Mozilla Firefox browser. To change from English to German (or vice versa) change the language settings of Firefox. If you use Firefox in a language that is not English or German, the default language for ShareOnVibe is English. To change the language of Mozilla Firefox, it’s helpful using an Add-on like “Quick Locale Switcher”. On Linux the option “Use password from Firefox storage” is not available. The OnUninstall listener is not working under Linux. Autosuggest (e.g. in the tag fields) is not working under Linux. On MacOS there are no success or error notifications displayed after you have shared content. Don’t worry, sharing does work fine. The new version can be installed on top of the older ShareOnVibe version. You don’t need to delete or uninstall anything. The installation should not change the settings you chose for your ShareOnVibe. To make sure however, you can export your settings. In case something goes wrong and your settings get lost in the update process, you can reimport them and don’t have to set them again. To send us a question, please mail to support@shareonvibe.com. We will be happy to help you. There is no 'Add current folder' in the context menu. Check if it’s a folder you’re currently on. Workspaces can not be added as targets, only folders. Check if the folder is probably already added. In this case, only the option “Remove current folder” is available. Reload the folder and try again. I added a folder and did choose to make a test entry. Creating a test entry doesn't work, I get an error message. Check if you have rights to create entries in the Vibe folder you have added. You can check this by clicking on View –> Who has access? and see if you are listed in the column “Create Entries”. If it’s not one of your own folders or if you don’t have rights to create entries, contact the folder owner or your Vibe administrator. I want to share a video but there is no option 'Share Video'. Check if you are watching a YouTube video. ShareOnVibe does only work with YouTube videos. If you are on YouTube, please, click next to the video – not directly on the video itself. Solution: Do you have several accounts for one Vibe installation (e.g. your personal account and the admin account)? Changing your login to Vibe in Firefox doesn’t change the ShareOnVibe session (connected via SOAP). This means your ShareOnVibe session still remembers your prior authentication. To stop a session, close and restart Firefox or open Tools –> Clear Recent History –> Choose “Active Logins” –> Clear Now. To start a new ShareOnVibe session, just share some web content to a Vibe folder. ShareOnVibe will ask you for logging in at the first share of this session. Solution: Do you use more than one Vibe installation? Quite likely you have configured folders from different Vibe zones as targets, probably with a similar friendly name. Please check the history of recent shares to find and open the last share. 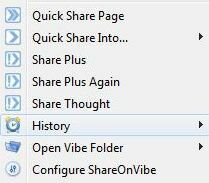 You find the history in the ShareOnVibe context menu by right-clicking in your browser. Check if you have chosen the right folder in the expected installation for your latest share. Be careful if your folders have similar friendly names (e.g. “Ideas ” in different zones). I tried to add Wiki topics as targets for ShareOnVibe but couldn't access them with the 'Search'-function in the folder configuration. Unfortunately, it is not yet possible to access sub-folders of a folder via the “Search”-function of the ShareOnVibe folder configuration. We are working on fixing this for the next version! Copy the Binder ID of the Wiki topic from the permalink (it is the number behind “binderId/” in the permalink). Paste this number into the field “Folder Id” of the ShareOnVibe folder configuration. Visit your Wiki in Vibe and use the menu on the left side (Navigation Panel) to click on the Wiki topic you want to add. Now, being on the Wiki topic, right-click and choose “Add current Folder” from the context menu. The Wiki topic is now added to your folder list. If you want, you can now change the folder’s “Friendly name” to a practical one. Open the ShareOnVibe configuration, double-click the recently added folder and change the value of the field “Friendly Name”. If it does not work after clicking on the Wiki topic from the menu on the left side, try to reload the page. Alternatively, you can copy the Wiki topic’s permalink and paste it in anew browser tab/window. This will ensure that Vibe is in the context of the correct folder, now. When I try to add folders to my ShareOnVibe configuration the 'Search'-function can not find sub-folders of folders. Solution: ShareOnVibe is connecting the Vibe zone via SOAP. Unfortunately, it is not yet possible to access sub-folders of folder, i.e. second level folders, via the “Search”-function of the ShareOnVibe folder configuration.. We are working on fixing this for the next version! Copy the Binder ID of the sub-folder from the permalink (it is the number behind “binderId/” in the permalink). 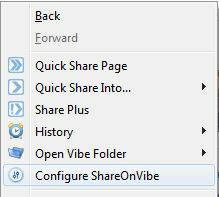 Paste this number into the field “Folder ID” of the ShareOnVibe folder configuration. Visit the sub-folder you want to add in Vibe, right-click and choose “Add current Folder” from the context menu. The sub-folder is now added to your folder list. It can be necessary to reload the sub-folder before the option “Add current folder” appears. If this doesn’t help, please copy the sub-folder’s permalink and paste it in a new browser tab/window. This will ensure that Vibe is in the context of the correct folder, now. I want to share web content to a Wiki folder / Wiki topic. Sharing doesn't work, an error message appears. Solution: Did you check if you have rights to create entries in the Wiki you have added? You can check this by clicking on View –> Who has access? and see if you are listed in the column “Create Entries”. If it’s not one of your own Wikis or if you don’t have rights to create entries, contact the owner of the Wiki or your Vibe administrator. Yes, I do have rights to create entries in this Wiki. Still doesn’t work. Probably, you want to share several content from one web page, e.g. some pictures, various selected text passages. The problem is, that every shared entry will get the same name, consisting of the web page’s title. By default, a Wiki folder requires entry names to be unique and does not allow two or more identical entry names. So, sharing a second entry with the same title (i.e. from the same web page) fails. You can deactivate the option “Force titles to be unique” for your Wiki folder / Wiki topic. Go to the folder, click on Folder –> Edit Folder and remove the check mark from the option “Force titles to be unique” (below the folder description field). Note: The folder type Milestones does also require unique entry names by default. All the other folders (except for Wiki and Milestones) do not. For the next version of ShareOnVibe we prepare offering the option to change the entry title while sharing! Solution: Check the tested and supported versions of Firefox here in the ShareOnVibe system requirements before upgrading your browser version. ShareOnVibe is tested and supported for Firefox versions 3.x – 32.x. Note: We are always trying to have ShareOnVibe running with the latest version of Firefox, but testing and finding solutions for system changes by Mozilla in the latest Firefox version may sometimes take a while, which is why we recommend using only versions of Firefox that are listed as tested and supported in the ShareOnVibe system requirements. Embedded YouTube videos are not displayed correctly in Vibe entries. 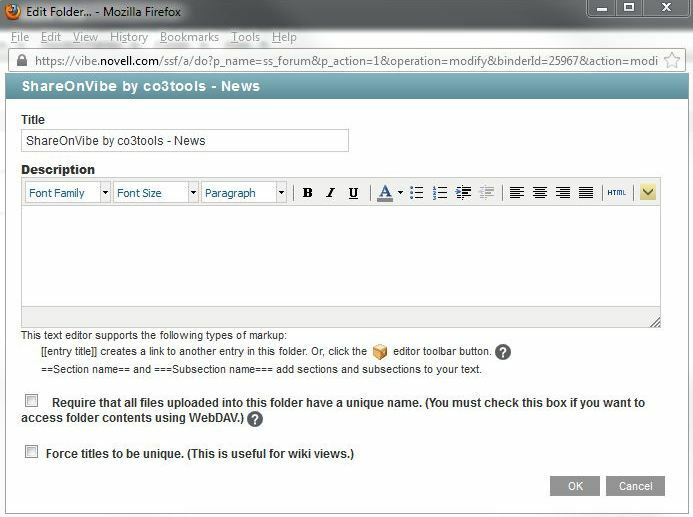 The reason for this issue is the way Micro Focus (former Novell) Vibe embeds Youtube videos since Firefox version 22 – therefore, this issue also applies to videos shared with ShareOnVibe which are embedded similarly. When this issue is fixed, all video entries shared in the meantime should work right away. When sharing a page, a picture, selected text, a linked file or a YouTube video, Firefox 22.x or higher automatically open the Vibe entry with the latest share in a new tab/window. Nevertheless, sharing works fine. This doesn’t appear when you Share a Thought or use Share Plus. Adding or removing a target folder works fine, but the action causes a new tab to open which displays a server error message from Vibe (Firefox versions 22.x or higher try to open a Vibe entry with “undefined” as entry ID – Vibe cannot handle this request because entry ID has to be numeric and reports an error). You can simply close the new tab and ignore the error message. 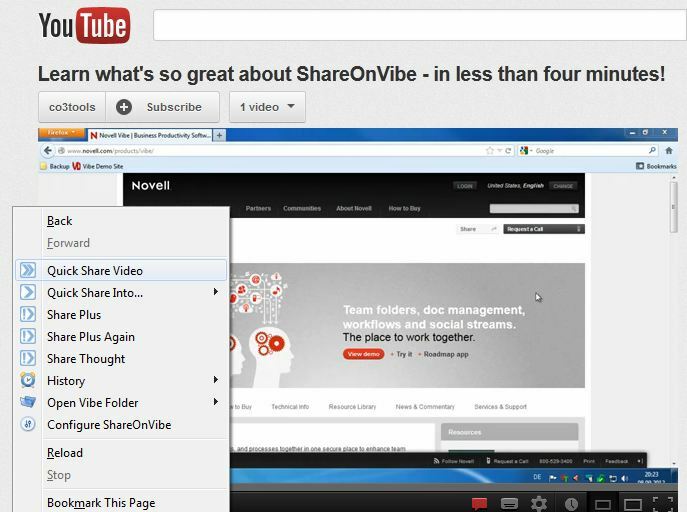 Update (August 7, 2013): Due to bugs in FF 22.x or higher, notifications from ShareOnVibe are automatically opened in an extra browser tab. We created a new build (1.0.48) to counter the bug. To use ShareOnVibe with Firefox 22.x or higher without issues, please request ShareOnVibe’s build 1.0.48 by mail or via the contact form. This is a known issue since Firefox version 15.x and already reported in the ShareOnVibe bug reports. What happens? On the first share with ShareOnVibe during a browsing session, the item you are sharing is created twice in Vibe. Note: On the first share, you usually enter your credentials in the following login window once to connect ShareOnVibe with Vibe. If you are using the Firefox password-manager you will not see the aforementioned login window (read more about Login and Password in our documentation). Nevertheless, the first share with ShareOnVibe after starting or restarting your browser may appear twice in Vibe. Create a dummy folder in your Vibe and use it always for the first (test-)share of a session (share any content). Now, that the first share is performed the duplicated entry is done and you can go on sharing relevant web content as usual. Use ShareOnVibe as always and remember to go back to the very first shared entry (e.g. via the ShareOnVibe History) to simply delete one of the doubly created entries. A selection / selected text can not be shared and I get an error message saying the selected text 'produced something that the server rejected'. Try to select more or less content on the website to share with ShareOnVibe. Sometimes, html formatted elements (e.g. tables, embedded images, headings), hidden html or scripts can confuse the share logic. Change the method of sharing from “Layout oriented” to “Content oriented”. Content oriented sharing of selections means that the “borders” of your content selection are followed as exactly as possible – the layout is only kept as good as possible and probably “messy layout” is not included anymore. 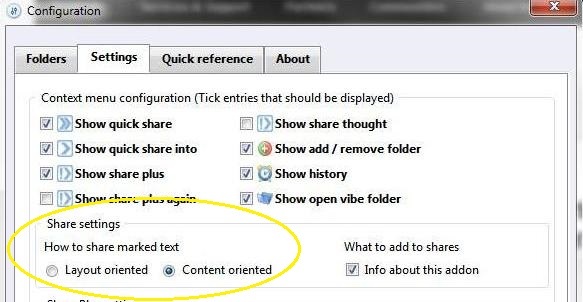 To change the method of sharing right-click, open the ShareOnVibe Configuration and open the second tab “Settings”. Change the method for sharing selections from “Layout oriented” to “Content oriented”. Don’t forget to click “OK” when you’re done. See our Quick reference to learn more about the setting of the sharing method. For documentation about ShareOnVibe see also: Getting started and Quick reference.